Like the under-performing India-UK relationship, bilateral ties between India and Canada present another conundrum. To call the India-Canada relationship underwhelming would be, well, an understatement. Bilateral trade between two of the world’s largest economies – India is the world’s sixth-largest and Canada the tenth-largest – with a combined GDP of about $4 trillion is a paltry $8.3 billion, according to figures from Statistics Canada. That’s a minuscule 0.2 per cent of all goods and services produced in these two countries. Both sides have made sporadic attempts in the past to push bilateral trade and investment into a higher growth trajectory but a mismatch of expectations and the domestic political compulsions of the current Canadian government are proving to be roadblocks in the process. The visit of Canadian Prime Minister Justin Trudeau and his family, though a huge public relations attempt, is unlikely to change the ground realities, at least not anytime soon. Perceptions that his government has a soft corner for separatist Sikh elements in Canada and his continuing molly-coddling of known sympathisers of the so-called Khalistani cause are among the major issues coming in the way of closer ties. Worse, the government of India accuses the Canadian government of actually providing shelter to those who are actively advocating separatism and providing funds and arms to their local agents in India. Separatism peaked in Punjab in the 1980s, when terrorists, often trained in Pakistan, spread mayhem across the state with a wave of murders and reprisal killings that left thousands of dead and many more missing. The government finally won the peace through firm law enforcement and reconciliation measures, but in the process many militant sympathisers migrated to and settled down in Canada. Trudeau has four ministers of Indian origin in his Cabinet and all of them are Sikhs. The Canadian Prime Minister has, in fact, publicly boasted that he has more Sikh ministers in his government than the government of India. But given their alleged links with separatists, Indian political leaders have avoided meeting them. Last year, the Congress Party’s Punjab Chief Minister Amarinder Singh had refused to meet Canadian Defense Minister Harjit Singh Sajjan. But foreign policy and strategic experts in New Delhi are actually quite surprised because Sikh immigrants form barely 1 per cent of Canada’s population. And while it is true that they form a solid and loyal vote-bank for Trudeau’s party, only a small but very vocal, well-organised and well-funded minority among them support the separatists. It is believed that many of these people are prominent supporters of Trudeau’s Liberal Party. The Indian government has made its displeasure quite evident – as can be expected from the Modi administration, which, unlike previous governments, does not back away from playing hardball when necessary – but has carefully shielded this behind appropriate diplomatic gestures. The Canadian media and a section of the Indian press have interpreted these signals, such as a very junior minister receiving Trudeau on his arrival, and no welcome tweet from an otherwise hugely social media savvy Modi, as a deliberate snub. Trudeau and family, meanwhile, went about their travels across India visiting various tourist and pilgrimage sites such as Gandhi’s ashram, the Akshardham Temple, the Jamma Mosque, the Golden Temple in Amritsar and the Taj Mahal in colourful Indian attire. This kept him on the front pages on a daily basis. Perhaps realising that the Indian government means business, he made some right noises over the last two days, declaring in no uncertain terms that his government is committed to the unity and integrity of One India. But he has, at the same time, spoken eloquently about India’s plurality and diversity, which many have interpreted as a coded message to his Sikh vote-bank that his party will continue to remain sympathetic to their cause. But despite these misgivings, the Modi government has rightly decided to stay engaged with its Canadian counterpart. Not doing so would have meant wasting an opportunity to create links with yet another G-7 member with which India does not have any unresolved strategic issues. Meanwhile, Trudeau met some of the top players of Indian industry. N. Chandrasekaran, Chairman of the Tata Group, Cyrus Mistry of Shapoorji Pallonji Group, Kumar Birla, Head of the AV Birla Group, and Anand Mahindra, Chief of the Mahindra empire were present. Agreements worth about $1 billion were inked between India-Canada, which, given the size of the two economies and the credentials of those present, should be seen as measly pickings. Two major agreements remain a work in progress. The Canada-India Foreign Investment Protection Agreement (FIPA) and the Canada-India Comprehensive Economic Partnership Agreement (CEPA), that, if signed, could add billions of dollars to each country’s GDP don’t seem to be going anywhere. One major sticking point is the insistence of the Canadian side on “progressive trade” – with strong emphasis on enforcing Canadian standards on environment, gender, human rights, labour rights and other such issues that India considers important yet red-herrings in the economic dialogue. 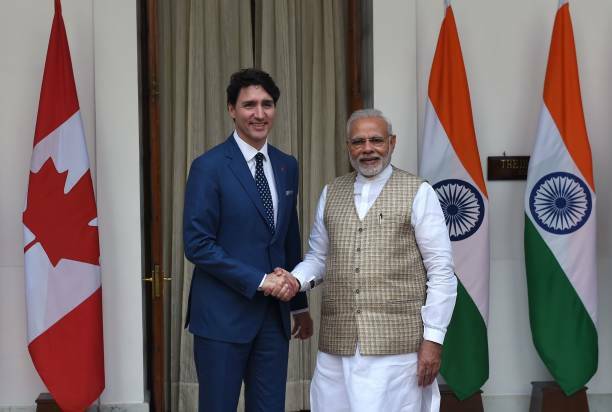 An Indian official was quoted in the media as saying that the Canadian government seemed more intent on pleasing its fringe domestic lobbies than in concluding meaningful trade and strategic deals. Trudeau and his family were in India for eight days. Out of this, meetings with Modi and his government officials were slotted for only half a day. That is a clear sign that India-Canada ties are drifting at best and cold at worst. The onus of improving it and giving it some meat now rests squarely on Trudeau – if only he can separate his domestic political narrative from his country’s foreign policy imperatives. But given that local politics is what seals a politician’s hold on power, it may be too much to wish for.